a quatrain from the book! The book is clever on so many levels. Each page depicts there are dots(circles) everywhere and their characteristics. The quatrain poems exposes clever rhymes, new vocabulary, opposites(some dots are big, some dots are small). Lot of dot information packed in simple graphic designs! Its also a great book for beginning reader with single sentence in each page. A wonderful book, perfect for circle shaped crafts. For the craft, we painted dots! Big dots - Balloon painting, Small dots - Q-tips/Cotton swabs. 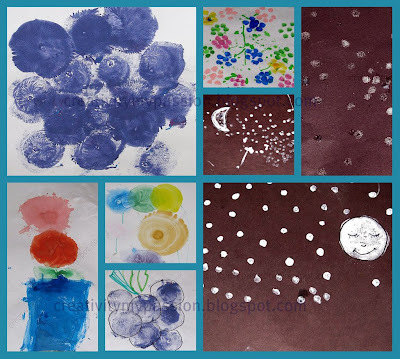 When I saw the balloon print - hungry caterpillars on Moments of Mommyhood Blog, I knew CJ will be excited to do the art. She did! All you need is a Balloon, paints and paper! Pour some paint in a Styrofoam container. CJ wanted purple color but we didn't have purple so she mixed blue and red color. Blow up the balloon in smaller size, so that the bottom is circle. Dip the Balloon bottom in paint. After painting big dots, we painted small dots using Q-tips. Dip Q-tip in paint and stamp. Dip the Q-tip in Glue and stamp on the paper. Sprinkle salt and shake off the excess. When Cj was 2 yrs old, We had created a starry night scene using semolina. I saw this salt paint earth at putti prapancha. Salt seemed to be a better option then semolina. I love the look of the book, and really like your craft choices - I'll be looking for that one! Esther, I love how the balloon painting turned out! The book sounds wonderful and like how you did all your different pieces of art correlating to different pages! Wonderful! I love this book and all of your projects they are so cute. The ballon painting would be so much fun to do with our art group thanks for the great idea!! I love how you did different project to go with each page. My kids would love the balloon painting! Thanks for the fun ideas. oh, so many different dots! Love these ideas! Have to give it a shot with some of them we haven't tried yet! This is soooo great!! We've never read this book before but I can't wait to get my hands on it so we can try some of these fun activities. I LOVED your grapevine prints too. So pretty! Thanks for Linking Up to our LOVE BOOKS! Can't wait to check out this book and make these adorable dot projects with my little ones!